The massive Claas Axion 930 is certainly no Tonka toy. The front axle suspension combined with four-point cab suspension offers excellent ride comfort. 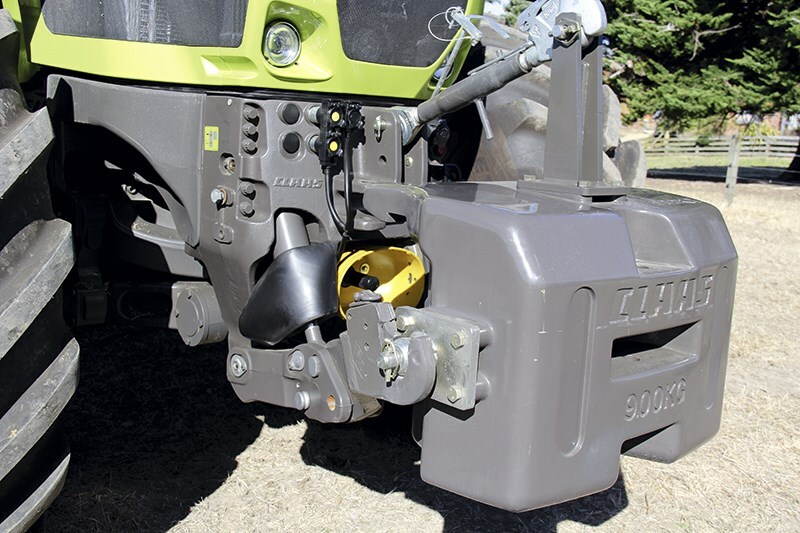 The 6.5-tonne front hitch will make light work of most duties, like the tiny looking 900kg weight block. The large rounded rear window offers excellent visibility to the wide equipment it will no doubt be hitched to. The hills during the test were deceptively steep but despite the large tall wheels on the 930 it felt very stable. 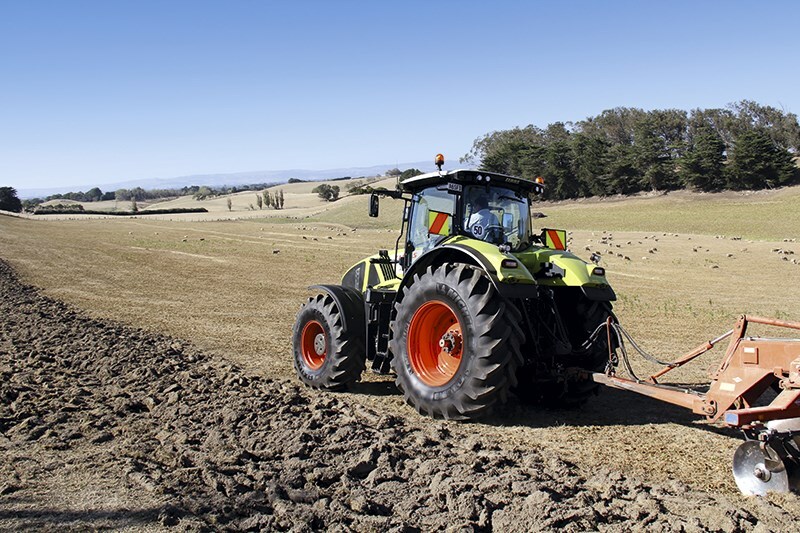 The 930 made light work discing the barren Manawatu hillside with fuel consumption never edging over 15 litres per hour. The right-hand steps easily lift up to allow quick and easy access to the battery. 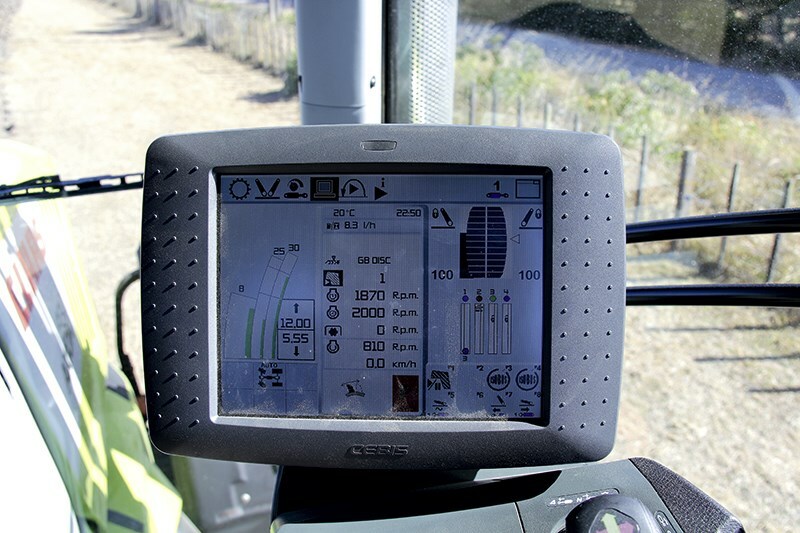 The CEBIS screen on the armrest allows the operator to tailor the tractor to their individual requirements. It’s not a touchscreen but I don’t think this is a downside. 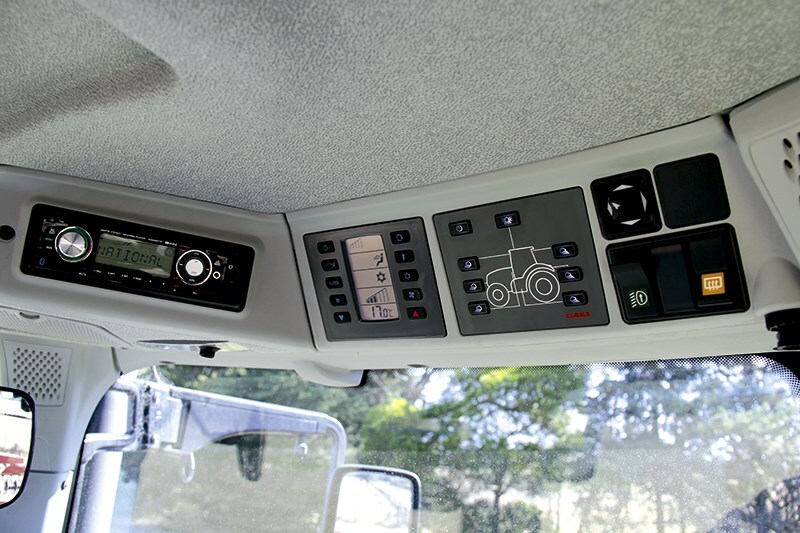 The lighting, radio and climate control for the large cab are all mounted on the right-hand side of the roof. 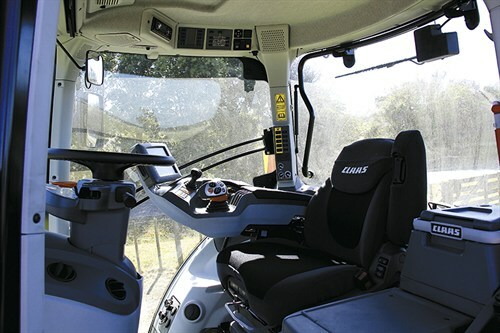 While the large flairs on the top of the cab make the interior hard to photograph, they provide the large glass area some shade, which helps keep you cool. The turbo has its own moulded vent in the bonnet to keep it working at optimum temperature. The large 8.7-litre FPT engine is mounted low in the frame to keep the even weight distribution Claas tractors are known for. 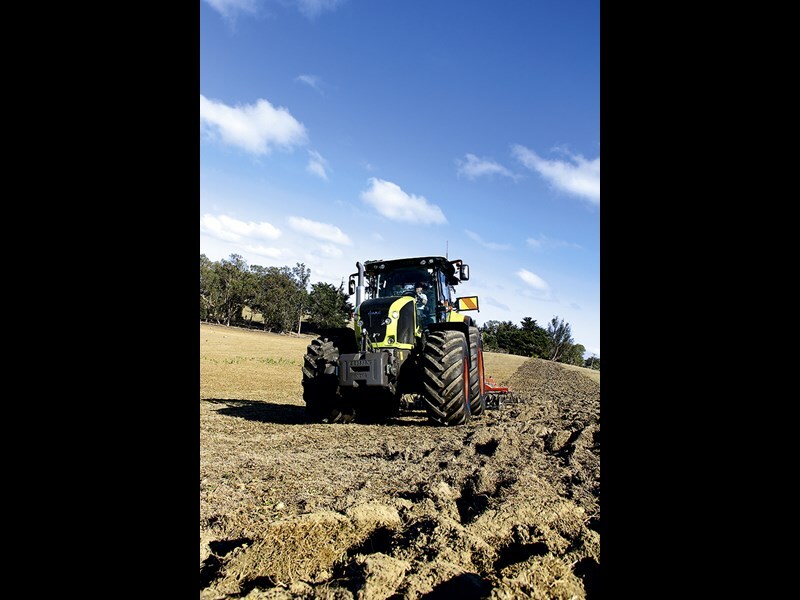 The pressure is on for manufacturers to design and build tractors to cope with the faster speeds and greater efficiencies farmers and contractors increasingly require. 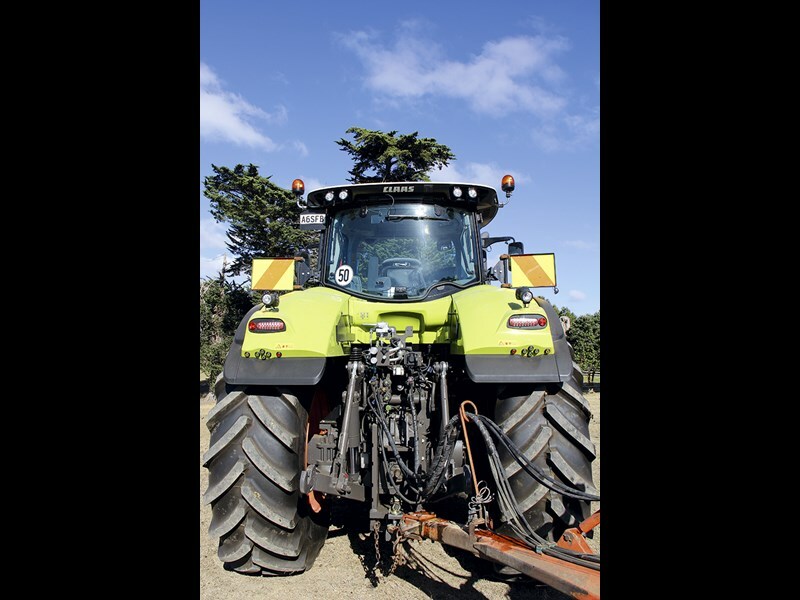 New Zealand reporter Jaiden Drought finds the all new Claas Axion 930 happy to oblige. It’s not often I come away from a test thinking I really should have taken a photo of the tractor in a way that really quantifies its size. Looking back, I don’t think my photos really portray how big the Claas Axion 930 really is. 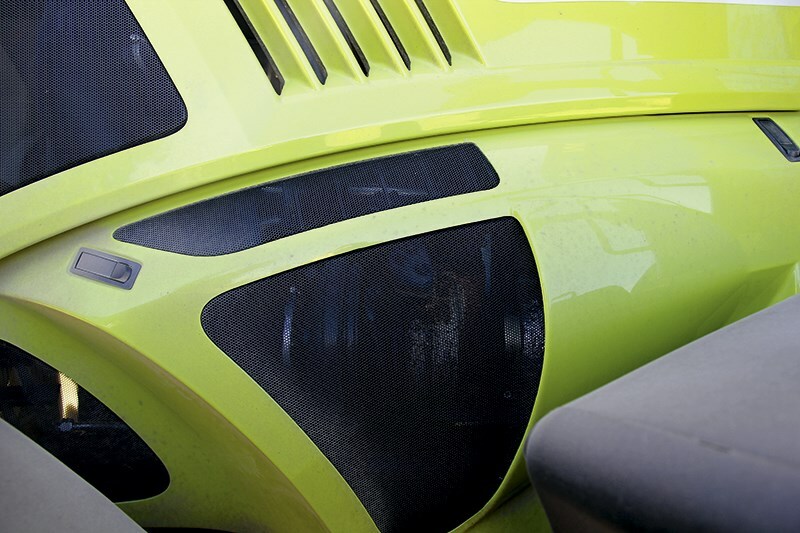 Claas is no new-comer to this high-horsepower category, with its existing Xerion high-horsepower tractors delivering more than 500hp, which one would expect will only expand further in the future. There are some nifty little features on this machine, because, as you are probably aware, you can’t just take a 200hp (147kW) tractor, put it on a course of steroids, and voilà — you have a 400hp (294kW) tractor. The machine sits on 650/75 R 30 front rubber and 710/75 R42 rears, although other 900s in the country are equipped with 710/60 R 34 fronts and 900/60 R42 rears, which are massive tyres and I’m sure your local Beaurepairs store wouldn’t carry any on the shelf if you happened to damage one. 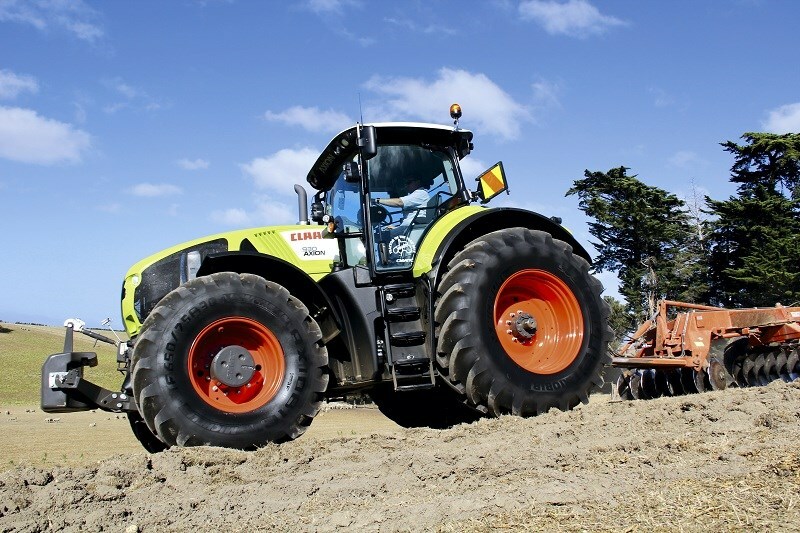 Claas has adapted the Fiat Powertrain Technologies engine for life within the Axion by mounting it in a half-frame chassis, which also allows it to sit low and keep the centre of gravity as low as possible. This substantial piece of casting incorporates the engine sump and leaves a tunnel for the four-wheel drive shaft, while out front the 6.8-tonne capacity front linkage can perform without the need for extra bracing. Because of the moulded chassis with the low sitting engine, it means components and daily checks are all accessed from ground level, without compromising ground clearance, as well as improving the steering lock angle for maximum manoeuvrability — although this still requires 13m of space to do so. Additional front ballast is not needed for many tasks, primarily due to the 3.15m wheelbase and the 55/45 (rear/front) weight distribution. 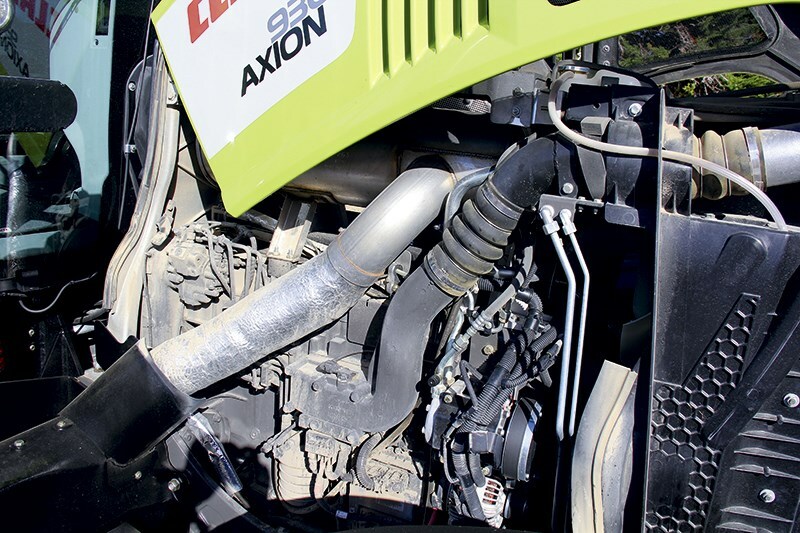 As I mentioned, Claas has opted for the Cursor 9 from Fiat Powertrain Technologies (FPT) and boasts the latest common rail 4-valve technology, charge-air cooling, and a wastegate turbocharger. The engine is very low revving, with the maximum torque (all 1,450Nm of it) being produced between 1,100rpm and 1,600rpm, which is impressive to say the least, but more impressive was the average fuel consumption for the discing — around 15 litres per hour from a 350hp (257kW) tractor. A cool new feature is the ‘visctronic’ electronic fan, which ensures the fan speed is precisely aligned with engine temperature and load. This is all directly linked to the engine ECU, ensuring that the engine always runs at the optimum temperature and reduces fuel use. Additionally, the reduced fan speed lowers the noise level and the machine is very quiet for its size, which is both a combination of the hip, new fan and the low revving engine. Claas has opted for the ZF Eccom 3.0 continuously variable transmission (CVT) for the Axion models, which it has dubbed CMATIC, and is capable of 50km/h at just 1,600rpm (40km/h is also available). This CVT has four mechanical ranges which are automatically selected by multi-disc clutches and there is no need to shift between ranges manually. The high mechanical component of the transmission (verses hydraulic power) provides efficiency by getting more power to the ground than some other CVTs on the market. During field work, at between 7km/h and 15km/h, the transmission averages more than 80 per cent mechanical power and for transport operations the CMATIC transmission will be averaging a 90 per cent mechanical situation, which in turn will result in fuel savings. For driving itself, the transmission has three operating modes auto (foot pedal), Cmotion (hand control) and manual mode. Foot pedal mode is pretty self-explanatory (where forward speed is controlled by the accelerator pedal), while Cmotion allows the operator to push the chucky hand lever forward or backwards depending on which direction you want to go in. In these two modes, engine speed and transmission ratio are adjusted automatically by the engine management system, Claas Power Systems (CPS). The mode in use is displayed on the CEBIS screen, while a bright orange button on the armrest allows you to switch between auto and Cmotion on the go. However, to get into manual you must activate this through the CEBIS screen. In manual mode, the driver chooses the engine speed and transmission ratio and this essentially disengages the automatic engine and transmission control. The CMATIC transmission provides three speed ranges in each direction, allowing the use of three different cruise speeds in each direction, which can be pre-selected. Each of the three ranges offers different rates of acceleration and separate cruise control functions. The transmission works very well and is easy to get in and drive — particularly in pedal mode — when driving off the CMotion lever you simply push forward or pull back on the stick to reach your desired speed. Changing between the modes is done via aN orange button on the armrest. The only negative here is that the shuttle controller on the steering column also features the park brake (huge fan of this) but the Cmotion lever also has a single button which allows you to change direction, although the shuttle lever must be in neutral for this to work so could do with some more fine tuning. 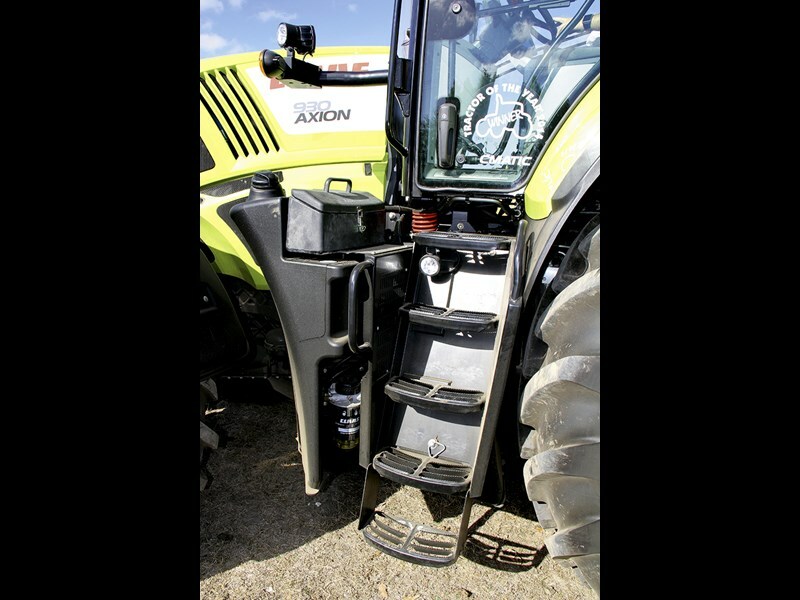 The Axion models are equipped with a load-sensing hydraulic system with flow volumes of 150 litres per minute, or the larger 220 litres per minutes (which our test machine was specced with) as well as 80 litres of oil for external use. It has up to six electronic spool valves at the rear and a single double-acting valve (there’s an option for two) at the front, as well as a single flow return valve. All spool valves have time and volume control, as well as a continuous flow function and Power Beyond as standard. All valves can be interchanged from the colour-coded paddles onto the Cmotion lever on the armrest. 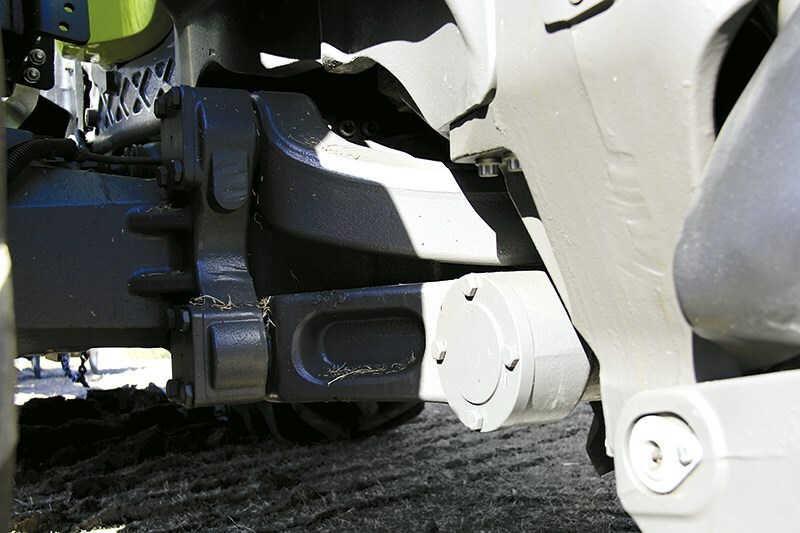 All the hydraulic couplings at the rear have release levers, so they can be connected and disconnected even under pressure, which is a great feature from the older models, but Claas has gone one step further with the coloured +/– markings on the inlet and outlet sides which make it easier to attach implements correctly. All Axion 900 models have a maximum lifting capacity of near enough to 11 tonnes, which I suspect will prove sufficient. The front and rear linkage both have dials to set depth control and are mounted on the armrest, although the rear linkage can be moved to the preset working depth or transport position at the touch of a button on the Cmotion lever. When it came to the new Axion’s cab, I was promised big things and wasn’t disappointed. Attention to detail and driver comfort were obviously at the front of my mind and even from the outside the lowset door handles were a nice touch so you don’t have to climb all the way up the six steps to open the large one-piece doors. The foot-operated tilt function for the dash and steering wheel make individual operator adjustments easy, and my favourite was the ventilated premium seat. The heated and air-conditioned seat was my favourite feature, right up to the point when I realised that the suspension automatically adjusts to the driver’s weight. Let me point out though, this is not good for self-esteem as it felt like the compressor was going to run out of breath. My only justification is that a really skinny bloke was in the seat before me (I can neither confirm, nor deny these claims). The cab is four-post, unlike the five-post design on the new Arion range, although the large rounded rear window and one-piece doors offer excellent visibility. Forward visibility is good. The four-post cab suspension has also been tweaked to further improve what was already a very comfortable place to be, as well as the addition of front suspension, which comes as standard on the 50kph versions like our test machine. More than 20 machine functions, including the transmission, linkage, hydraulics, GPS guidance and headland management system are controlled using either the Cmotion controller or the buttons on the armrest. The CEBIS terminal is easy to read and most existing operators will be familiar with the thumb-wheel-controlled menus which work well, although many would like a touchscreen. I would prefer it to be a little larger over the touchscreen equivalents, if anything. Just like the Joe Cocker classic ‘When the night comes’, 14 front (actually 16, but you can switch the headlights off in favour of four xenon lights on the cabs pillars) allow excellent forward visibility as the lights shine over and beyond a front hopper, mower, buckrake or other front-mounted implements. The Axion 930 is certainly no Tonka toy. This is a serious bit of kit that needs a serious amount of work laid out in front of it to justify the outlay. But you’ll be hard-pressed to find a more comfortable tractor on the market, and when it’s coupled with a very user-friendly cab and a smart and easy-to-operate transmission that can hoon along at 50kph, there aren’t too many boxes left to tick. I was doing some research on the power and price of these 400hp-plus tractors and it seems the six major tractor brands selling machines of this size actually provide quite good value for money in terms of dollars per horsepower, with the tractors ranging from $465-$645 per horsepower. I should clarify that when I say they represent good value for money, that shouldn’t be confused with ‘inexpensive’. This research should really only be used as your trump card when convincing the wife of such a purchase — there will still be a large amount of ground work (literally) before you get this one across the line. For the full test report, pick up a copy of NewFarmMachinery magazine issue 10, on-sale now. Subscribe to the magazine to never miss an issue. Find Claas tractors for sale. Look up Claas tractor specifications.